DANE ‘AVIATION’. The Difi Aviation Classic leather jacket is a pilot style classic touring jacket. One of the many features that this jacket has is a detachable thermal vest and a foam shock absorber in the back which you could replace with a CE back protector. 2Xl with armours. Motorbike leather Jacket. Size is (2xl). Picture attached is the jacket pictures. Jacket chest is 49" . 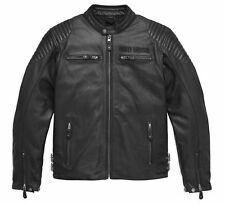 P131-026 56 - Spidi Ace Leather Motorcycle Jacket 56 Black (UK 46). TheSpidi Ace Leather Motorcycle Jacket is part of the latest Spidi collection. Spidi Ace is the most classic example of a leather motorcycle jacket, featuring a very essential design with strong references to the cafe racer world. HARLEY DAVIDSON / DUCATI. Wiese, S100 Cleaning Products, Silkolene Oil. & virtually every motorcycle product currently available from our wide range of suppliers. Galfer, Remus, Vance & Hines, Akrapovic, Gilles, R&G. ‘BUDDY’ 2.0 MS LEATHER. Constructed of full grain cow leather. COLOUR: BLACK. MOTORCYCLE JACKET. SIZE GUIDE. Picture Is for Illustration Purposes Only. IMPORTANT INFORMATION . Fully perforated away from critical zones for maximum strength. Bike jacket for young boy or girl. leather bike jacket ,,only worn twice. HARLEY DAVIDSON ®. HARLEY DAVIDSON / DUCATI. Two front vertical vents, two back exit vents. Body armor pockets at elbows and shoulders. Lightly padded back waist, shoulders, and elbows. Action back, side zipper gussets, and slightly pre-curved sleeves with inner arm sleeve darts for less bulk. Two front vertical vents, two back exit vents. Lightly padded back waist, shoulders, and elbows. Action back, side zipper gussets, and slightly pre-curved sleeves with inner arm sleeve darts for less bulk.